Perfect spot to enjoy a cup of coffee or a glass of wine! 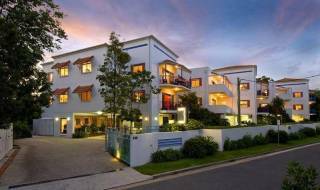 Spacious and quiet Apartment no.1 Bayona is supremely situated opposite pristine Little Cove Beach Noosa Heads, with direct access and a 3 min walk in either direction on Noosa famous boardwalk to Hastings Street or Noosa National Park. 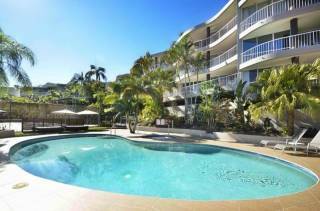 This 2 bedroom, 2 bathroom apartment with a large north facing balcony has a modern bank of 6 glass sliding doors which give a wide uninterrupted filtered view of the Noosa north shore coastline and Laguna Bay. The apartment is tastefully decorated with charm, character and original artwork giving the interior a delightful presentation. The lounges are suited to relaxing and reclining while watching TV, reading or dozing. it has a generous fully equipped, spotless kitchen, a separate internal laundry, master bedroom with ensuite, and a second bedroom with a generous king. Both the bedrooms open to a grassed area at rear with another seated area to rest in the cool of a summer afternoon. Undercover and street parking are available. This is a great apartment to settle into and for long bookings we offer a further substantial discount which can be negotiated directly with the owner. Some of the extra inclusions free of charge. 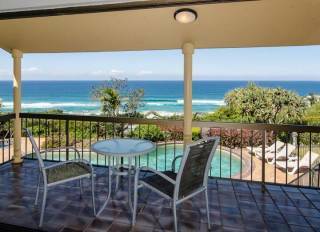 With privacy, mild temperatures all year and secluded Noosa beaches within a very short walking distance, this clean and comfortable holiday apartment is a popular choice as a year round holiday destination. There will be many memories you will take home but the evening sunsets from your balcony or from the steps of Little Cove will stay in your thoughts long after your holiday ends. Down to the basics: Air Conditioned and ceiling fans throughout, the apartment is fully self-contained and comfortably sleeps 4. Flat screen TV is in the lounge and also in main bedroom and 2nd bedroom. DVD with a small library and 2 sound docks. All linen is provided however the unit will not be serviced during your stay. Dishwasher tabs, kitchen essentials and washing machine powders are provided. 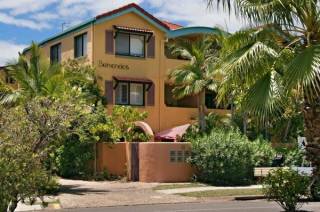 Address: 1 Bayona 32 Alderley Tce Little Cove Noosa Heads 4567 QED Australia. The Noosa River is the ideal spot for the fishing enthusiast and the Everglades are perfect for a relaxing scenic cruise, or, for the thrill seeker, jet skis, wave runners and wake boards are available for hire from many of the jetties along the river bank. Why not try long boarding from the board hire at first point. 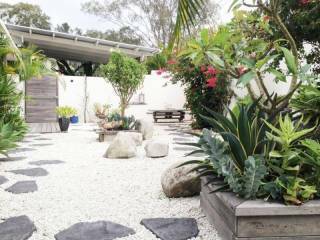 Other things to do in Noosa & the surrounding area include golf, catamaranning, surfing, snorkelling, whale watching between July and October, horse riding, fishing, sea kayaking & of course, Noosa's favourites - dining out & boutique shopping. When you stay with us we will provide you with a list of our favourite casual and fine dining restaurants and of course offer a substantial discount if you choose to holiday again at 1 Bayona.